Yep, the title of this post is true. I am not buying clothes for a year (with just a few caveats I'll get into later). After evaluating my spending, priorities, and values, I realized that the purchase of clothing was cluttering my life, both physically and mentally, and I wanted it to stop. Perhaps this is an extreme approach, or mild, depending on your vantage point, but I'm going to guess for the majority of young women it's extreme. I'd love to have a discussion on why we feel the need to purchase clothes constantly, if it really adds value to our lives, and its effect on the world at large. Let's get into it! Why do we buy SO MUCH CLOTHING? A cute top here. Some new shoes there. Don't have anything else to do? Well, let's go shopping. No doubt, this is something you've experienced pretty often in your life. We use shopping as entertainment and a way to bring us temporary happiness. It's the old syndrome of never having enough. I used to think that my wardrobe would be "perfect" or "complete" if I could buy just one more thing. If I could just get my hands on the most classic bag or the most eye catching jewelry. What I've come to realize is that possessions don't bring us happiness. Sure, we may find that a certain outfit makes us feel good because we think it looks good, but when we allow the endless pursuit of perfection to take over our minds and actions, we are heading down a path where we will never reach "the end." Does creating a wardrobe and buying clothes add value to our lives? For this, I think it's both yes and no. When I am wearing an outfit I really like, I feel good and I think that is valuable. When I am buying clothing to reach an ideal I have in my mind of what the perfect wardrobe looks like and reflects (i.e. having it all together and being perfect), then I don't believe there's value. As we all know (because we read about it all of the time), we are quite often caught up in consumerism. Now, it's not necessarily our "fault" (if we're going to be assigning blame) because we've certainly been conditioned this way, but it is our fault if we don't take the time to examine the impact it has on our own lives. I've discussed my exploration of minimalism quite extensively on the blog, but this goes beyond just the aim to have a small, "capsule" wardrobe, as we see rising in popularity. This has to do with the actual placement of our values and where we derive our worth from. How does this impact the world at large? So, there's this thing called "fast fashion" which refers to the cheaply made clothes you find at places like Forever 21 that are made by people in dangerous conditions and who aren't justly compensated. I am no real expert on this topic, but you can read more about it here. Being socially conscious and refraining from unnecessarily bringing more into the world is so important. Remember that every dollar you spend is a vote and a statement on what you believe in and what you say is acceptable. 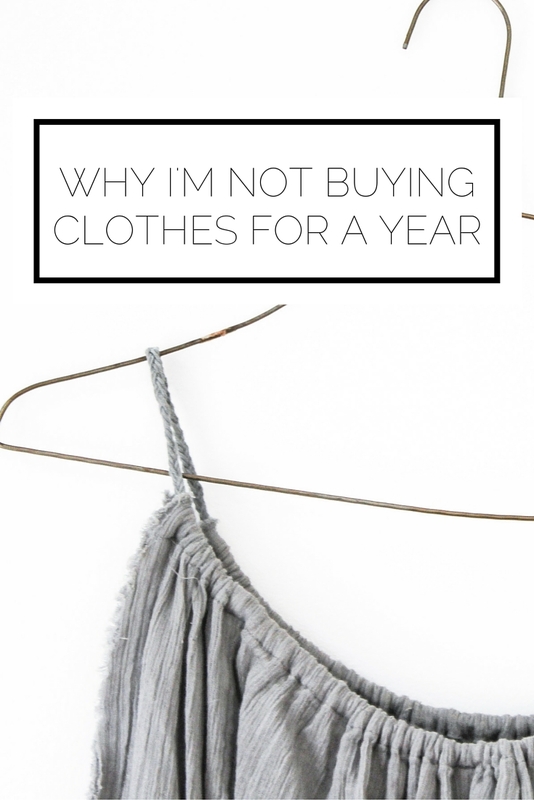 As the title indicates, I'm not buying clothing for one year. This is a challenge I gave to myself (because I so love a challenge!) and it was born out of a variety of circumstance. I want to save money. I am a poor college student who is getting ready to enter the real world, and I want to do so with money in my pocket. I want to have less stuff. Moving to and from school has shown me just how much clothing I own and, let me tell you, it is more than enough. I want to spend on experience and not things. If I am going to spend money, I want it to be on something more lasting than a pair of jeans. Experience which give me memories fits the bill. I want to learn more about ethical fashion and respond accordingly. I want to be the type of person who makes decisions with more in mind than just "This looks good." Like I mentioned at the start of this post, there are some caveats. I'm allowing myself to replace items which are worn out and I can make purchases from a predetermined list (this included a few items I have been on the hunt for for a while and some key pieces to augment my professional wardrobe). I've been going strong for four months now and it makes me so happy! I'm saving my money, getting more creative with my existing wardrobe, and finding that I had a lot more than I thought. 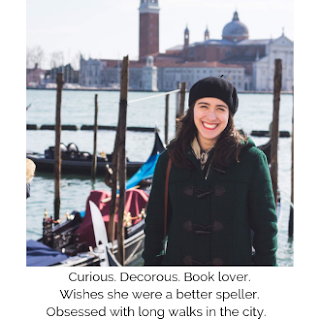 We don't need to be constantly pursuing more to make us happy; in fact, the less I shop, the more my friends and I find meaningful ways to spend time together without it revolving around spending money, and that is what makes me feel fulfilled. I'm furthering my minimalist lifestyle and am wicked pleased. Would you ever stop shopping? Why would/wouldn't you think it's a good idea?